a-films: report: "Nahr al-Bared's economic recovery hampered by military siege"
report: "Nahr al-Bared's economic recovery hampered by military siege"
More than two years after the end of the fighting, the war-torn Palestinian refugee camp of Nahr al-Bared, located in northern Lebanon, is far from the model the Lebanese government has promised the camp would become. Instead, reconstruction of the camp is delayed, the area is a military zone with restricted access, and the camp's economy is stalled and residents are largely unemployed. 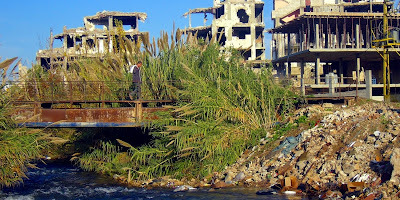 Following a 15-week war in the summer of 2007 between the Lebanese army and the militant group Fatah al-Islam, who occupied portions of the camp, Nahr al-Bared was totally destroyed. So far, about two-thirds of its 30,000 Palestinian inhabitants have returned and resettled on the camp's outskirts. One of them is Jihad Awed, who sits in front of his tiny clothing store and tells about the good times before the war. "My shop was larger and I sold more products. It went well and I made a living. I sold between $130 to $200 per day." Having returned to Nahr al-Bared after the war, Awed started to sell shoes, but went bankrupt. He sold his wife's jewellery and opened his new store, which barely makes $30 a day. "I can't live on it. The rent is $100 per month. I buy cigarettes and coffee and my income is gone," Awed explains. Charlie Higgins, Project Manager for the Reconstruction of Nahr al-Bared with the UN agency for Palestine refugees (UNRWA), describes the economic situation in the camp as "stuck." Higgins says that "It hasn't changed very much since the early months after the end of the fighting. The economy has not regenerated and the employment situation has not significantly improved." He explains that residents are still living in a temporary environment and partly haven't returned to Nahr al-Bared. The camp has also lost its linkage to the surrounding Lebanese communities. Higgins states that "The area remains within a military perimeter and that has effectively regulated and to some extent prevented the re-establishment of the close integration that existed before." 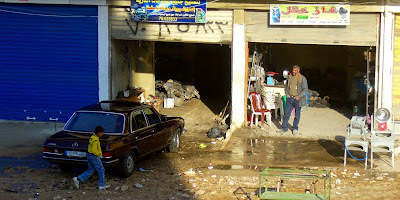 Indeed, most of the shopkeepers in Nahr al-Bared blame the lack of customers from outside for their terrible situation. Nasser Nassar, who refills and sells cooking gas canisters, claims that "The checkpoints and the siege [by the Lebanese army] are the biggest problem." He explains that unlike before, Lebanese customers prefer to buy outside the camp, adding, "Why should they come to the camp, requiring permits and subjecting themselves to being searched and having their IDs checked?" Unlike other Palestinian refugee camps in Lebanon, Nahr al-Bared once was an open economic hub for the whole region. According to a 2008 survey by UNRWA, about half of its customers were Lebanese. Since the fighting ended, the Lebanese army has maintained control over what remains of the camp, including its destroyed centre and heavily-damaged adjacent area, as well as the Palestinian refugee population that called Nahr al-Bared home. Access to the camp is only possible with special permits issued by the army's intelligence service. 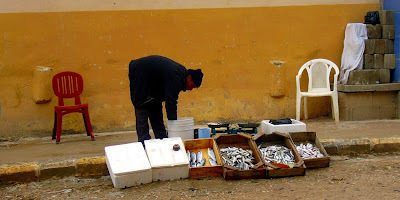 Various non-governmental organizations have attempted to recover Nahr al-Bared's economy. Premiere Urgence (PU) has provided 220 entrepreneurs with in-kind grants. Julien Mulliez, PU's head of mission, says: "Recovery of the economy is obviously compromised by the current conditions of access to Nahr al-Bared. The problem is that access to the camp is dependent on prior authorization [by the Lebanese army], resulting in fewer customers visiting the camp." The Palestinian-Arab Women's League (PAWL) has conducted five similar projects. Sahar Itani, PAWL's Program Coordinator, says she fears for the sustainability of the beneficiaries' businesses. "It's because of the limited customer base that's currently available in the market in Nahr al-Bared," she explains. "We've reached a market saturation situation." In his clothing store, Awed complains that the camp's merchants are selling to each other, while everybody is just sitting around. "The money circulates on the same spot. Nothing comes in," he says. Hassan Mawed, the president of Nahr al-Bared's traders' committee, estimates that Lebanese account for less than five percent of all current customers. According to Mawed, "This is far from being enough to boost Nahr al-Bared's economy. In fact there's some kind of bartering going on in the camp." Sakher Sha'ar is a hairdresser whose salon is located on Nahr al-Bared's former main street. Sha'ar laments the lack work, explaining that "There are 29 barber salons here. As long as nobody can enter from outside, 29 are too many for the area." A few blocks down the street, Salim Mawed has a barber shop. He says his daily sales are about $20 compared to approximately $35 before the war, when he owned his shop. "Now I have to pay rent for the salon, the tools etc.," he says. "In the end nothing remains." Before the war, around two-thirds of Nahr al-Bared's labour force worked within the camp's boundaries. As Palestinian refugees face heavy legal and social discrimination in the Lebanese labour market, working outside the camp is difficult. Unemployment has re-enforced the will of many to emigrate. Mawed says that "If they opened the door to emigration, nobody would stay. I'd be the first one. I'd leave everything here." Since mid-October, the Lebanese army has allowed Lebanese citizens to enter the camp without extra permits, but only through al-Abdi checkpoint at the northern edge of the camp. However, the army's procedural change has neither attracted more Lebanese customers nor facilitated access to the camp. A journalist who requested anonymity recently entered Nahr al-Bared along with a Lebanese friend. "We counted 11 commands and questions to move 10 meters: 'Your ID! Open! Step out! Park!' It's terrible. This is a civilian area, not an army base! It's collective punishment of the people." A Lebanese employee of a non-governmental organization operating in Nahr al-Bared requesting anonymity says she still uses her permit, although she could enter without, as access is easier and quicker: "I rather spend 20 to 30 minutes more in our field office helping people instead of waiting until my name is cleared." The Lebanese government has declared that once rebuilt, Nahr al-Bared camp should become a model for better relationships between Palestinian refugees and their Lebanese hosts. But Hassan Mawed is tired of hearing this talk over and over. Raising his voice, he asks, "A model for what? A model for a prison? For a siege, checkpoints and humiliation? It should be a model that gives us freedom, civil rights, the right to work and property rights!" Reacting to increasing complaints by residents, the media, local organizations and parties as well as international organizations operating in Nahr al-Bared, the army recently issued a statement claiming the security arrangements "aim first and foremost to preserve people's safety through preventing the infiltration of terrorists and wanted people, smuggling of weapons, explosives, and illegal material." However, Marwan Abdulal, the Palestine Liberation Organization's official in charge of the reconstruction of Nahr al-Bared, has demanded the army lift the siege of the camp. According to Abdulal, "The basic requirement for the recovery of the camp's economy and social life is the removal of the checkpoints or at least the abolishment of the permits." Similarly, UNRWA's Charlie Higgins considers the Lebanese army's security arrangements "a significant barrier to the recovery of the camp in every sense." It remains uncertain if the Lebanese government and the army will respond to these complaints and allow Nahr al-Bared to be rebuilt or if the siege will remain in place and the promises unfulfilled. This report was written by one of our activists. It was first published here by Electronic Lebanon.